These days it is getting harder and harder to keep up with increasing demands to post more real estate content to your blog. In just the last couple of years, there has been a 253% increase in real estate related search terms put into Google, which means that more and more buyers and sellers are looking to hire real estate content creators. In fact, 78% of consumers report trusting agents that provide fresh real estate content over those that don't! But if you’re going to get your real estate content found by the buyers and sellers you’re hoping to convert with it, you’ll need every competitive advantage you can get. As you know, video is a powerful SEO tool that can go a long way to help you raise your rank on Google. Especially, if you post your videos to Youtube (which is owned by Google). Are you eager to improve your Google ranking and get more targeted, organic traffic to your real estate website? 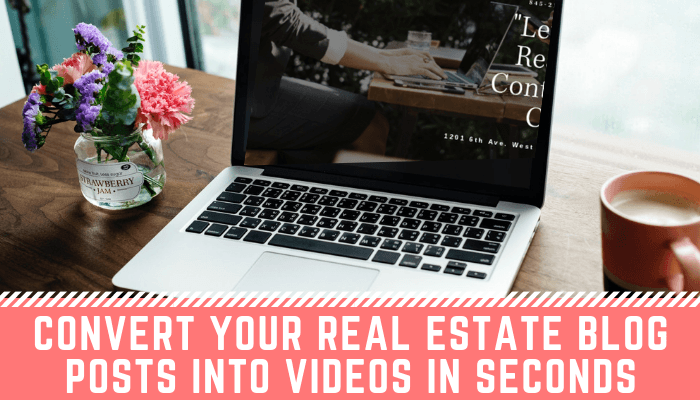 Are you overwhelmed by how much time and effort it takes to create highly engaging videos for your real estate website, vlog, and social media? Are you open to learning how to convert more clients using video marketing WITHOUT having to take an elaborate course or invest in expensive equipment? If so, today’s post was made for you! Recently, I discovered this amazing software that actually allows you to be able to generate engaging videos for your vlog, website, and social media channels in just seconds! Obviously, I’m going to share that badass software and cheatsheet with you in a moment, but first, if you haven’t already, please subscribe to my Youtube channel so you can get more handy-dandy advice and practical how-to videos from me on the reg. You know I’m over here trying to fight the good fight for all of you right?! I know many of you don’t have a huge marketing budget so I teamed up with the creators of the software to be able to give you my beloved tribe exclusive free access to both the software and the SEO cheat sheet so make sure you stick around to get in on those goodies! His name is Content Samurai and I luuuurrrve this little bugger! I know better than most just how time-consuming it can be to create real estate blog posts, videos, and podcasts to promote your brand! Recently, I was looking for a way that I could help all of you to get more out of every blog post that I provide you. So I went on a search, and then I found the Content Samurai software and HOLY MOLEY I am SOOOOOOO pumped that I did! With Content Samurai, if you can copy/paste, then you can transform your real estate blog posts into videos in just seconds. Honestly, you could use this software to create dozens, maybe even 100+ videos in a single day if you put your mind to it!!! Do you have any idea how much of an impact that many videos can make on your SEO, web traffic, and lead generation?! This is a MAJOR GAME CHANGER! 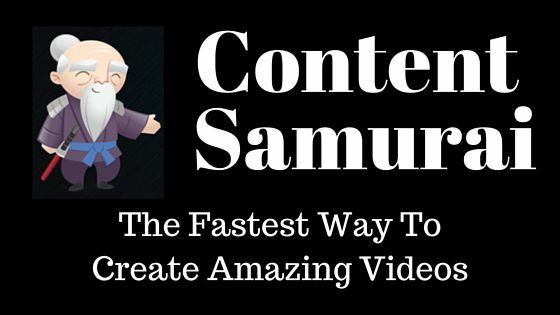 Once you sign-up for your Content Samurai account, all you will need to start creating your videos is the text that you want to convert into a video. From the dashboard, select Create New Video. The software will prompt first prompt you to copy/paste your text into the text box. From there, you can elect to have the software work it’s AI magic and automatically create the video. If you wish, and I suggest you do, you can also add music and a voiceover to the video. You can further customize your video by swapping out the automatically selected images with images of your own and your own video footage. For example, if you are using Content Samurai to create videos to market your listings, you can easily import the photos of the listing to use alongside the text from your SEO-friendly listing description. With just a few simple, straight-forward steps your video will be generated and ready for you to add to as many platforms as you wish. Don't worry, there is a very simple and easy-to-follow tutorial that will walk you through the process when you sign up for the software using the exclusive free trial and discount I've arranged for you. Your videos are no good to you if they aren’t bringing you traffic and clients right? Well, if you want to get gobs of traffic, you gotta know a few tricks of the trade that maximize the SEO of each video. Don’t worry because in addition to securing you guys an exclusive free trial for Content Samurai I also got you guys free access to a pretty sweet cheat sheet that will make ranking your videos a piece of cake! You can download the Video SEO Cheat Sheet right here. Need Help With Creating Content For Your Real Estate Blog, Website, Or Videos? Obviously, the most direct way that I can help you with that is by writing your real estate content for you. If that is something that you would like to explore further, you can book a free consultation with me here. However, if you aren’t ready to financially invest in your business just yet, I also have tons of more advice available for you to help you create viral real estate content. You can find more tips here on my blog, on my podcast, on my Youtube channel or on my various social media platforms like my private Facebook Group Blogging For Facebook Leads.